This brochure provides a general survey and overview of the range of topics addressed by the Ecologic Institute. It includes examples of relevant events and projects, and key financial information. The brochure captures essence of the Ecologic Institute at a crucial time in our development. The past years have brought consistent growth, increasing diversification, strong management, and the establishment of a number of offices and subsidiaries. For the founders of Ecologic, the Institute is a vision that has been realized: a private non-profit think tank for applied research, policy analysis, public-interest advocacy and consultancy. Today the Ecologic Institute is a voice for environmental and climate protection, sustainable development in international and European affairs, and international cooperation and exchange on debates about environmental policy. The brochure Ecologic Institute 2009 is available for download [pdf, 2.3 MB, English]. Kraemer, R. Andreas et al. 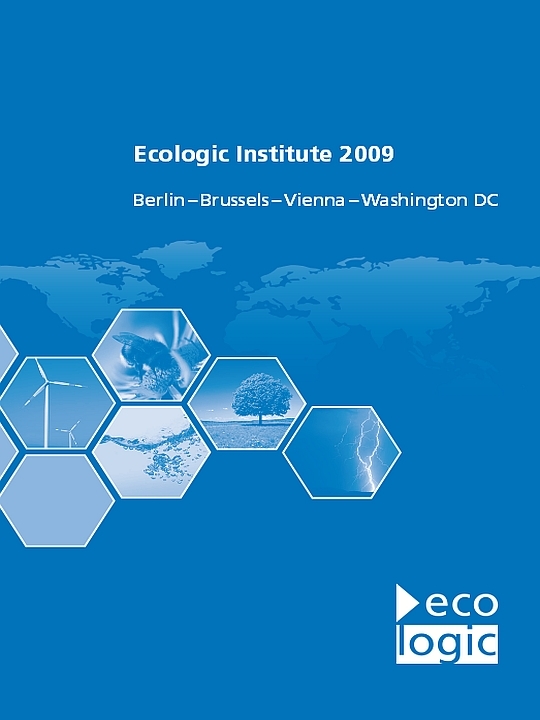 2008: "Ecologic Institute 2009 Berlin - Brussels - Vienna - Washington DC", in: R. Andreas Kraemer and Sascha Müller-Kraenner (eds. ): Ecologic Briefs on International Relations and Sustainable Development. Berlin.